The ride for Day 1 would be from Kolkata to Siliguri, a distance of around 600 kms. 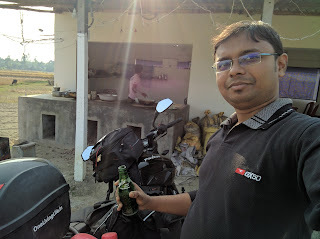 Although, I had done long rides previously (Dajipur), this was going to be my first from Bengal. I planned to wake up at 3:00 am and start at 3:30. But, it never goes as you plan. Not being used to prepare a motorcycle for long rides, it was the first time when the cameras, saddle bags, tank bag, GPS holder, jerry cans and USB cables were mounted all together at the same time. 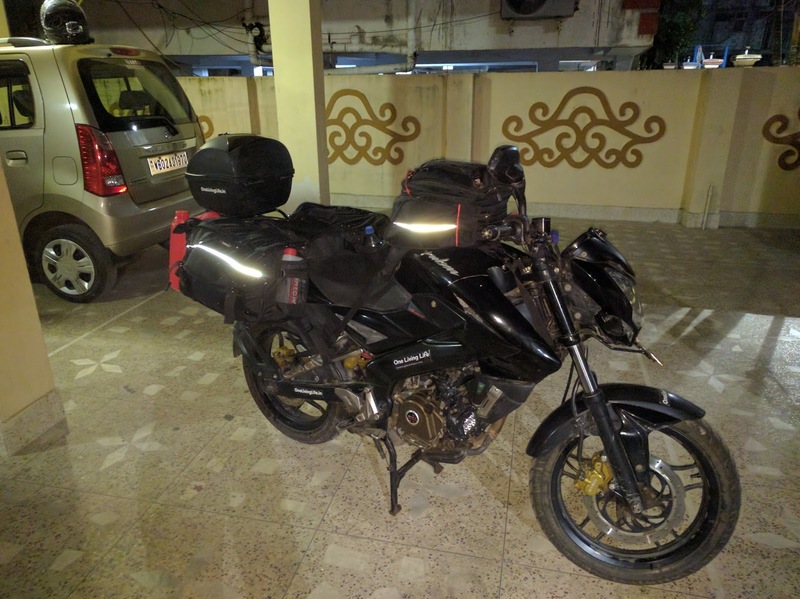 Finally, at 4:30 am, I was ready to spark the engine for the longest ride and the toughest terrain of its life. The 'Black Beast' gave out its soft purr, ready to churn out 24 bhp on a twist. I started slow and easy because it was going to be a long day. The wind had a chilly feeling but Kolkata could never make you shiver. The Parama and AJC Bose Flyover made it easy to leave the city fast. 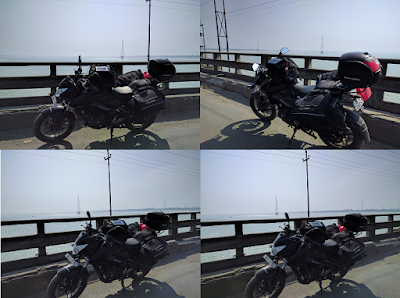 But, incidents were in store even before I could cross the Hooghly Bridge. My GPS holder broke off ending its life span in 2 years. The tank bag took its job after that. 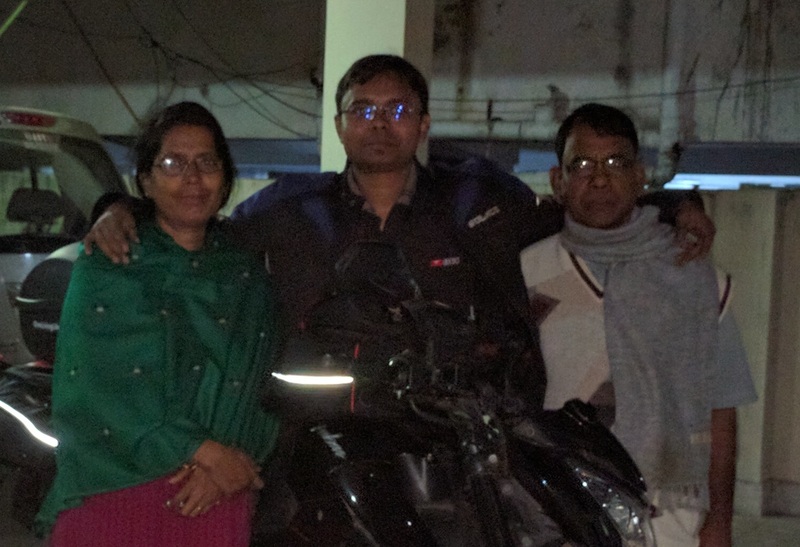 I had set an expectation to reach Siliguri/Bagdogra within 12-15 hrs i.e. somewhere around 5-6 pm. On long rides, I try to cover most of the distance within the initial 60-70% of the time. But, trucks and traffic at Kona Expressway made things difficult. Henceforth, on the Durgapur Expressway, it became an easy ride but the winds were strong enough to make you shiver. The visor, if opened accidentally could smack you hard. While refueling at Burdwan, I came to know from a Petrol pump that it is illegal to carry petrol in jerry cans. 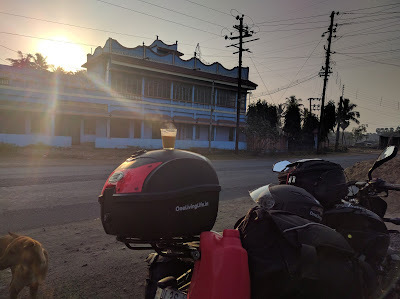 As the sun started shining brightly, I halted for a cup of tea that gave the warmth I needed on such a cold morning. Speeding through the State Highway 7 till Funtisako was comforting. You have roads good enough to keep your speeds over 100 and then the patches come up that surprise you. 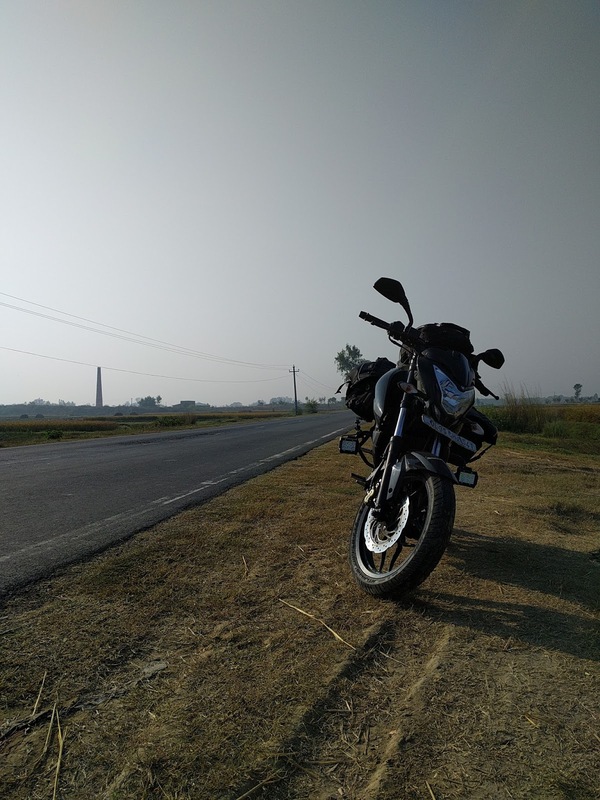 A few hundred kilometers after Burdwan, I got a call. 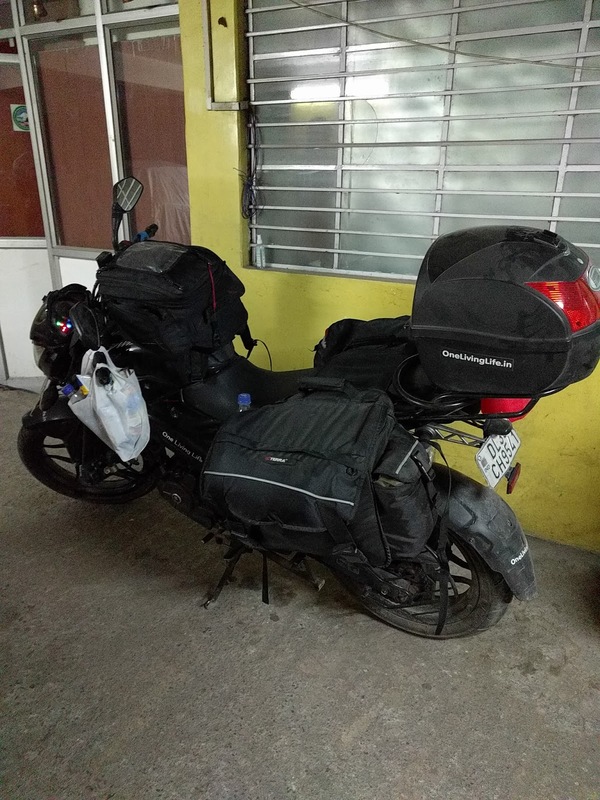 It was from Siddhartha Guchait, the guy who was also preparing for a solo ride to Gurudongmar. His schedule was uncertain till the morning but later on he did start for the same a few hours after I left Kolkata. I was happy to have a friend ride with me for the same destination. Our route and scheduled varied as I got in touch with him just a few days before the journey started. Thanks to Anjan Sarma, a senior rider from Kolkata who introduced me to him. Again, thanks to Jignesh Thakkar from B.P. Roadies who introduced me to Anjan Sarma. As Siddhartha was a few hours behind me, I decided to move ahead and stop for lunch and rest when we would meetup. We stayed in touch throughout the rest of the journey. Small stops, refueling and tire pressure checks continued on the way. 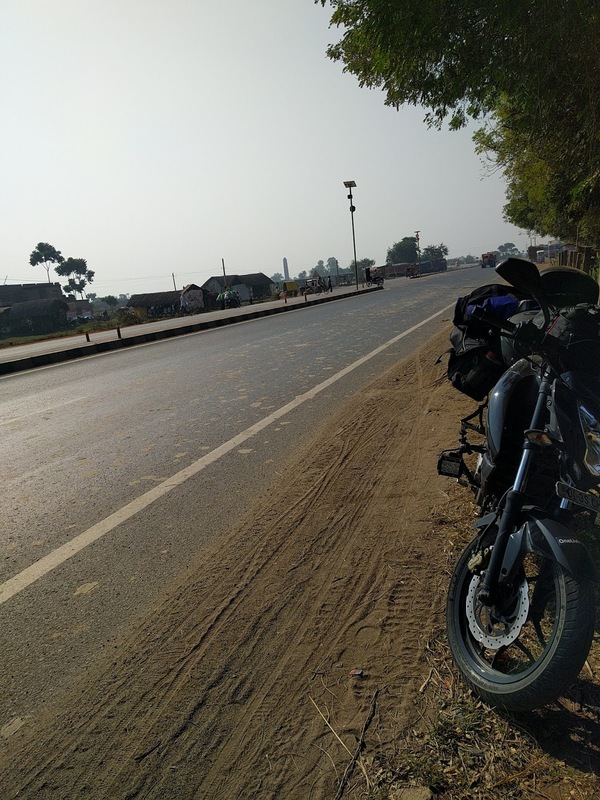 My neck started paining after a few hundred kilometers and a few awkward looking push-ups and sit ups by the roadside had to be done. My body needed to be stretched and relaxed for the long ride, without caring how the passers by looked at me. Anyways, they were staring at a heavily loaded motorcycle and a geared up person. 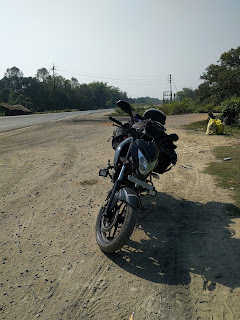 and halted to fuel up my body somewhere before Raiganj. I rested there for about 2 hours and waited for Siddhartha so that we could ride together. Meanwhile, the villagers there were delighted to see the new 2000 rupees note for the first time. 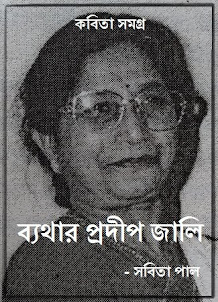 I got it from my manager at work, Dipankar da. We finished our lunch and left Raiganj by 3:30 pm. 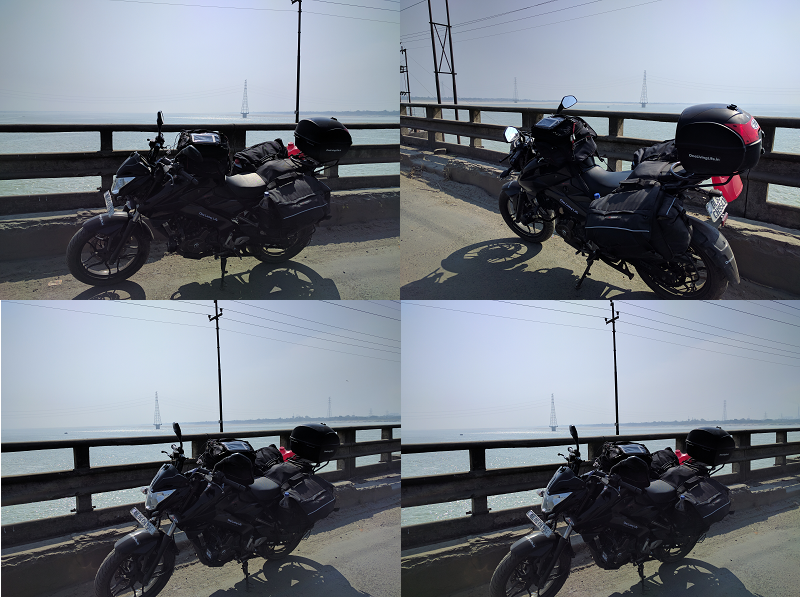 With another 200 kms more to go, we took it casually. Little did we know what was left in store for us. The wonderful NH12 had turned into a one-way potholed road. And, then it turned worse. Probably, Islampur onward the road towards Siliguri becomes a narrow street road that turns and winds up frequently. The huts and bushes encroach up to the edge of the tar making it difficult for you to watch out for oncoming/crossing traffic on your way. With too much population around, it gets scary at times when small children suddenly cross the road in front of you. It was too tiring by then, since we were riding for almost 12 hours at a stretch. Concentrating so hard was becoming difficult. More so, when the sun set and darkness made it more difficult. Nonetheless, patience becomes the key on such long rides and we rode ahead keeping a steady focus. 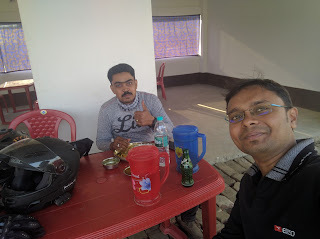 A short tea break before Siliguri and we confirmed Soubhik Da, (another Biker from Siliguri) about our stay at Hotel Phoenix near Hill Cart Road. We reached our Hotel at around 7:30 pm and I had to unload all the luggage once again. This was a painful part of the whole day. Loading and unloading everything was time consuming and not easy at all. But, it was this small part of every day that would give me unprecedented happiness and excitement for the next few days. Had a hell lot of chat with Siddhartha on the way and at the hotel. 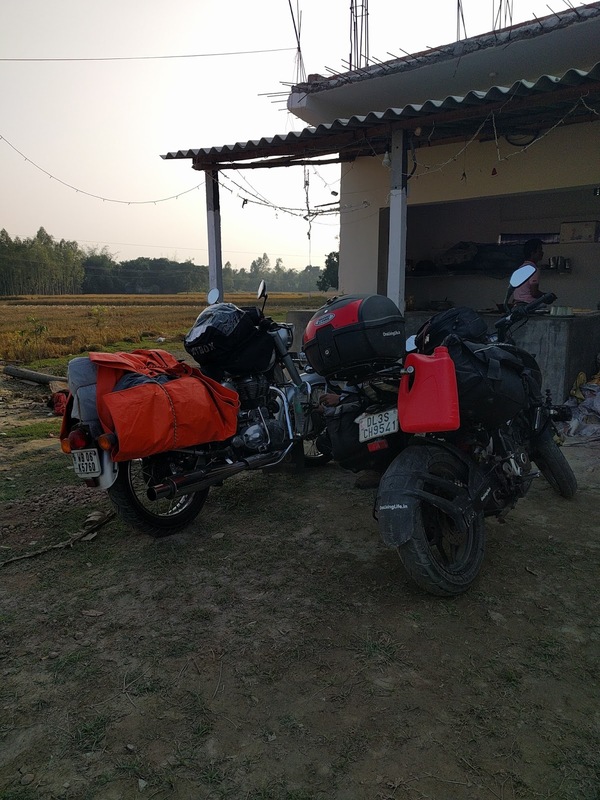 We were two like minded souls whose motorcycling spirits were shunned by the world outside and we found a heart full of stories and thoughts to share. We were sure to plan and ride hard again.